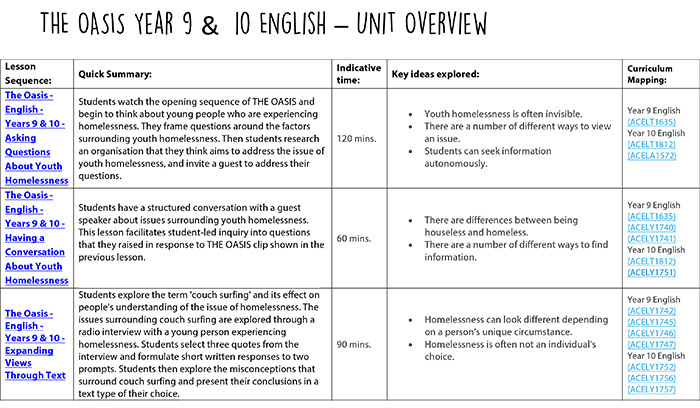 THE OASIS – English – Year 9 & 10 is based on THE OASIS documentary, which raises awareness of youth homelessness and celebrates the resilience of young people who are experiencing homelessness in Australia. It is designed to empower the next generation of young people to take action to prevent youth homelessness in the future. The resource is organised into an inquiry unit containing individual lessons. Each lesson incorporates clips from the film as well as a number of other real-world videos, articles, pictures and infographics as learning stimulus. The unit has adopted an action-based, experiential learning approach and activities encourage student participation through movement, group work, ICT and visible thinking routines. 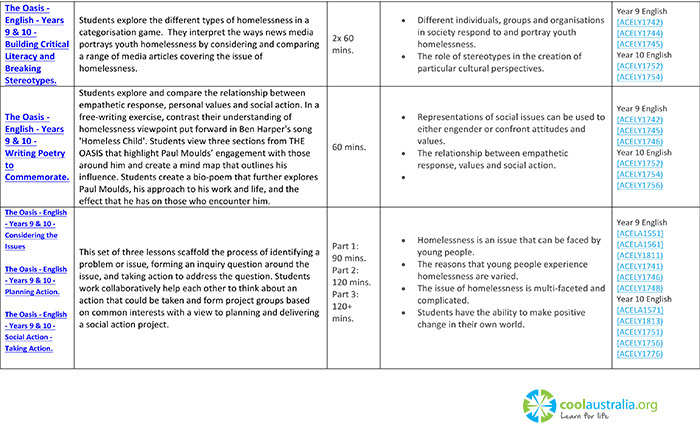 Students are required to engage in meaningful reflection at the conclusion of each lesson, and are encouraged to continue their thinking and scrutiny around the topics addressed throughout the lessons – both as summative and formative assessment. Each lessons features extension ideas and provision of learning support. The investigation and learning completed throughout the unit is then applied to student’s local context through a teacher scaffolded student-led social action project, wherein students choose an issue to address and present their project for exhibition to a real audience. This unit address the content descriptors of the Australian Curriculum: English. Learning activities in this resource are suitable for use across Years 9 & 10, and have also been mapped to Units 1-4 of the Senior English curriculum. The resource is made up of a series of sequenced activities that incorporates clips from THE OASIS documentary. The lessons can be taught as an entire sequential unit of study, or as ‘cherry picked’ lessons. 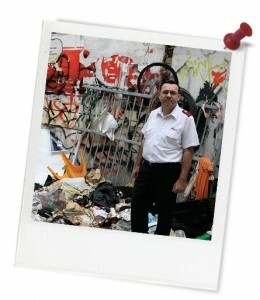 “Charting Salvation Army Captain Paul Mould’s struggle to improve the fraught lives of the Oasis kids, this observational documentary is a tribute to the power of one man’s persistence in the face of seemingly unrelenting darkness. As time unfolds, some kids pull themselves out of misfortune and aspire to greater things, while others sink deeper into addiction and desperation. In the midst of all the chaos Paul battles unflinchingly on to save these lost children, and reflects on his own past along the way.” Further information can be accessed here. Access to THE OASIS documentary on Vimeo. Speaking with students, staff, family members and the local community prior to screening the film in order to pre-empt any possible responses, especially if some students relate to the experiences of characters within the film.